Dr. Precious Moloi-Motsepe is a leading businesswoman, entrepreneur and philanthropist in South Africa and was named one of the country’s Most Influential Women in 2012. She believes fashion has an important role to play in economic development and social change, and in self-realization. Over the past decade, through her company African Fashion International, she has enabled African designers to take their rightful place on the fashion runways of the world. She is also CEO of the Motsepe Family Foundation. Born and brought up in Soweto, Dr. Moloi-Motsepe grew up with a profound awareness of the strong need for social and political change in South Africa. She was only seven years old when she saw her own grandmother die from the complications of hypertension, a chronic disease that should have been routinely treated. This fuelled her ambition to become a doctor to work to prevent such needless death. She studied medicine at the University of the Witwatersrand as well as Stellenbosch University, ultimately pursuing paediatrics and specializing in women’s health. She worked as a doctor in South African public hospitals and as a general practitioner for 20 years, which contributed further to her interest in development issues. Working in the U.S. at the Medical College of Virginia in Richmond from 1991 to 1992, she became increasingly interested in women’s health. On her return to South Africa in 1993, she opened one of Johannesburg’s first women’s health clinics. In 2000, she spoke on “Women and Health in the Workplace” at the Global Summit of Women. She has also served as President of the Cancer Association of South Africa from 2002 to 2007 and received the Elizabeth Tshabalala Award for Raising Breast Cancer Awareness in 2012. Other noteworthy awards include: in 2011, under the auspices of the Global Fund and of Friends of the Global Fund, she was appointed Champion for Africa by Gift From Africa, aiming to mobilize private-sector support in Africa to fight HIV/AIDS, TB and malaria; IWFSA – Excellence Award in recognition of sterling contribution to business and community; in 2015, recipient of the Enactus Entrepreneurship Award as well as the Humanitarian Award from Keep A child Alive, which is run by the Alicia Keys Foundation. In 2002, she took the helm of the Motsepe Family Foundation, a philanthropic initiative that she and her husband, mining magnate Patrice Motsepe, founded. The couple are now part of The Giving Pledge, an international movement founded by Warren Buffett and Bill Gates, whose members commit to donating half their family wealth to development causes. One of the Motsepe Family Foundation’s most recent projects was the March 2017 launch of The Little Black Book, a resource guide for everything from health to entrepreneurial queries for women. 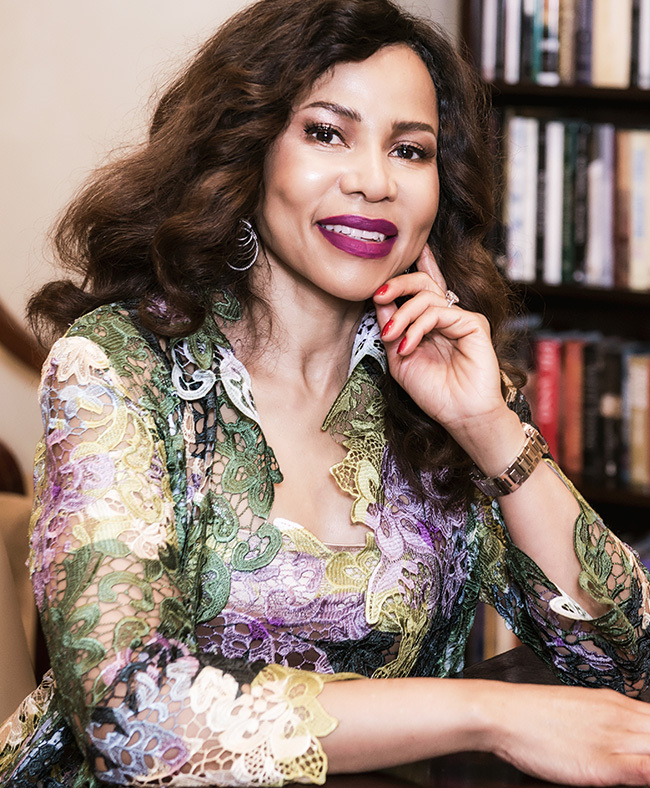 In recognition of her continuing interest in women’s issues, Dr. Moloi-Motsepe serves on the Harvard Kennedy School’s Women’s Leadership Board, which addresses gender equality in the workplace. She is also a past member of the World Economic Forum Global Agenda Council on population, which she chaired in 2014. Having inherited a classic sense of style from her elegant mother, Dr. Moloi-Motsepe has also always enjoyed the creative flair of the fashion industry. In 2007, she acquired events company Leisureworx and used it as a vehicle to build African Fashion International (AFI), a platform of properties that enables social and economic development in the continent through one of the world’s favourite passions: fashion. AFI’s properties now include: AFI Fashion Week Joburg, AFI Fashion Week Cape Town; fashion development programs AFI Fastrack and AFI NextGen; online lifestyle portal AFI Experience; online retail portal AFI Privé; and associated properties AFI Awards and AFI Fashion Masterclasses. Dr. Moloi-Motsepe anchored development initiatives in the fashion sector, injecting an entrepreneurial consciousness and aiming to ensure that designers are as capable of succeeding with the business of fashion as they are in the world of design. She believes that a key to competing successfully in the global fashion market is combining high-quality design and craftsmanship with Africa’s heritage and history in a distinctive fashion package. She has also ensured that her concern for welfare overlapped with mobilizing the power of fashion through projects such as the Design for Life Breast Cancer Campaign. Additionally, she pioneered African luxury fashion through her establishment of African Fashion International, believing it was vital to build a critical mass of globally recognized African design talent. Through her efforts, several African designers have been launched in New York, Paris and London, including David Tlale, Thula Sindi, Eleni Labrou and locally Rich Mnisi, Khothatso Tsotetsi and Tuelo Nguyuza. Her initiatives also attracted international fashion attention from the likes of legendary fashion guru Suzy Menkes, currently International Editor of Vogue Online, and creator of New York Fashion Week, Fern Mallis, to African fashion events. The late Franca Sozzani, then Editor-in-Chief of Vogue Italia, subsequently dedicated a whole issue to showcasing African designers and models. Dr. Moloi-Motsepe will receive F4D’s inaugural Franca Sozzani Award in 2017, presented by Franca Sozzani’s son, the Emmy Award-nominated film director Francesco Carrozzini, and by Norway’s HRH Crown Princess Mette-Marit on behalf of Fashion 4 Development. She will be recognized for her outstanding efforts in promoting African fashion designers through African Fashion International as well as supporting the empowerment of disadvantaged women.